While the analysis of generations has been central in the sociological understanding of social change, the role of the media in this process has only been acknowledged as an important feature during the last couple of decades. Building on quantitative and qualitative comparative research, Media Generations analyses the role of the media in the formation of generational experience, identity and habitus, and how mediated nostalgia is an important part in the social formation of generations. 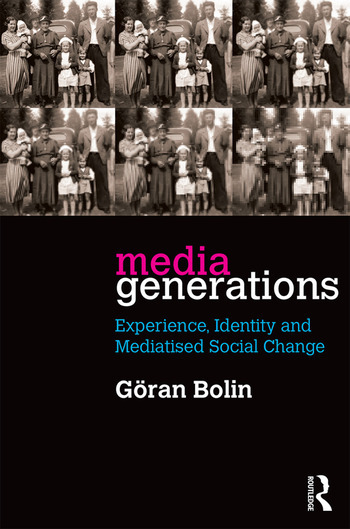 Avoiding popular generational labelling Göran Bolin argues that the totality of the media landscape is a contextual structure that together with age and life-course factors help inform world-views and ways to relate to the wider society that guide the actions of media users. Media Generations demonstrates how - as different generations come of age at different moments in the mediatised historical process - they develop different media habits, but also make sense of the world differently, which informs their relations to older and younger generations. It also explores how this process of ‘generationing’, that is, the process in which a generation come into being as a self-perceived social identity, partly builds on specific kinds of nostalgia that establishes generational differences and distinctions. This book will be of special interest to those studying social change, collective memory, cultural identity and the role of the media in social experience. Göran Bolin is Professor of Media and Communication Studies at Södertörn University, Stockholm, Sweden. He is the author of Value and the Media: Cultural Production and Consumption in Digital Markets (2011), and editor of Cultural Technologies: The Shaping of Culture in Media and Society (2012).